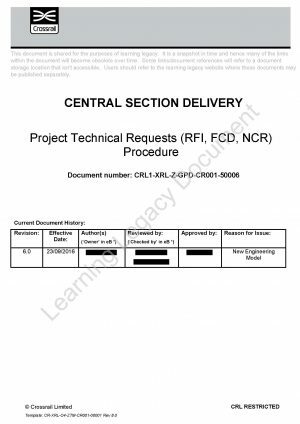 The Project Technical Requests Procedure is part of the Quality Management System of the Crossrail Delivery function. Project initiated technical questions, Request for Information, between parties under the control or interface management of the Delivery Team (DT). Field Change Documents (FCDs), relating to alterations to the assured design documents issued for permanent and temporary project systems and facilities. This procedure applies when the design is performed by Framework Design Consultants (FDCs) or others. Non-conformances found in the works including those that arose through inspections, audits and surveillances conducted by the Contractor, DT, Quality team or third parties. The procedure applies to the start-up, construction and testing phases of the project.